All of us are involved in selling every day. Whenever we present a product or a principle, inform a client, or instruct a child, we are engaging in the art of effective persuasion. Allow America’s master of the art of selling explain proven, practical sales techniques all of us can use every day. He provides vital strategies for specific closes, hundred of sales questions, and dozens of persuasion procedures to help everyone sell their ideas, or themselves. No matter what your age, gender, occupation, or lifestyle, these proven techniques from America’s selling sensation can work for you. 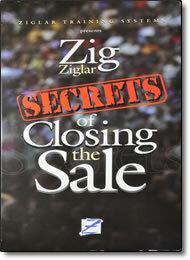 Zig shares tips and techniques from his vast wealth of sales experience. His insights will prove to you over and over why this is the definitive how to sales program. This powerful series of timeless sales messages will help you close more sales today as you build a career for tomorrow! Whether you’re a seasoned sales veteran or just now beginning your first sales position, Secrets Of Closing The Sale provides you with practical advice and effective questioning techniques that you can use to transform prospects into clients. Learn step by step over 100 specific closes and over 700 questions that lead the prospect to the decision table. Everybody Sells Something … what do you really sell?